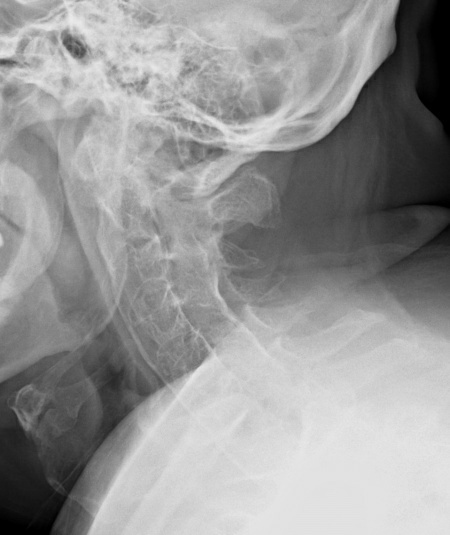 Lateral view of the cervical spine demonstrates vertically oriented syndesmophytes that extend over intervertebral disk spaces. Note subtle calcifications in the intervertebral disks. Facet joints are fused. There is generalized osteopenia. Differential diagnosis varies and depends on stage of disease. Early syndesmophytes in ankylosing spondylitis maybe difficult to differentiate from early diffuse idiopathic skeletal hyperostosis. Other differential considerations include ochronosis and other spondyloarthropathies such as psoriatic arthritis and reactive arthritis.